Entergram’s recently announced KonoSuba dungeon RPG, now officially titled KonoSuba: God’s Blessing on this Wonderful World! Labyrinth of Hope and the Gathering of Adventurers!, will launch for PlayStation 4 and PS Vita on March 28, 2019 in Japan, various retail listings confirm. In addition to the 8,618 yen standard edition, a 10,778 yen limited edition including an art book, costume downloadable content set, and PlayStation 4 and PS Vita themes will also be available. First-print copies of the game will include the bonus “useless goddess training” game KonoSuba: God’s Blessing on this Wonderful World! Educating this Useless Goddess! 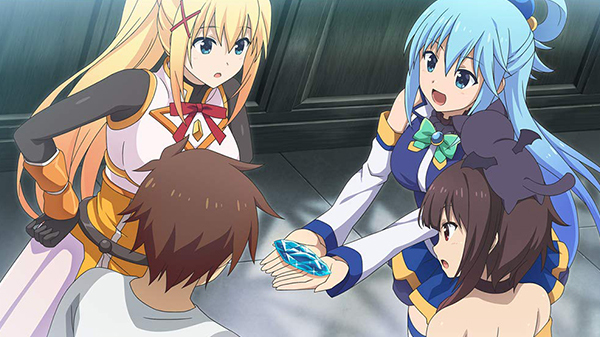 Aqua obtains a fragment of a magic stone that contains hidden power. In search of that magic stone’s mighty power and value, Kazuma, who had been enjoying a calm life, rises once again! This is a 3D dungeon RPG where players will borrow the strengths of new comrades to traverse many ruins and labyrinths, battle monsters that block the path forward, and unearth the mystery behind the magic stone. For the main story, you can form a five-character party with the protagonist Kazuma in addition to Aqua, Megumin, Darkness, and one more character . Outside of the main scenario, you can take on guild quests where you can choose the four non-Kazuma party members as you like. There are also quests that only specific party members can receive, so the breadth of your adventure will expand depending on your party formation. Form a party of your favorite characters, or form one that is balanced and efficient. How you put together your party is up to you! This is a new adventure full of many CG, from beautiful event CG that stir up the story to cut-in CG that enliven battles.